In 1897, J.E. Cooper, a relative newcomer to the village, set about to remedy the lack of an organized fire department due to lack of equipment and discouragement by the previous firefighters. 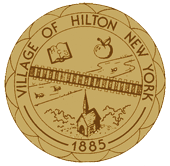 The Hilton Fire Department was formed and officers elected at a meeting in the Village Hall on Oct. 15, 1897. The first officers were: John E. Cooper, Chief; C.V. Babcock, assistant chief; B. J. Daily, secretary; and Z.W. J. Newcomb, foreman. The Hilton Record, a weekly newspaper, was founded April 22, 1897 by John E. Cooper who came to Hilton from Middleport, N.Y. The Paper, begun there with 100 subscribers, at a subscription rate of one dollar per year, attained a circulation of 500 the first year. In September 1909 the Hilton Electric Light Co. was organized by J.E. Cooper, A.B. Fraser and M.D. Holbrook to manufacture and distribute this commodity in Hilton. The village entered into a 5 year contract with J.E. Cooper to furnish electric street lights (replacing the outmoded kerosene lamps) to be started at dark and turned off at midnight. By 1925 the demand for rural service had become greater than the Hilton Electric Light and Power Co. could handle and the local electric company was sold to the Rochester Gas and Electric Corporation. the system to dial. Hilton's manually operated telephone exchange in the "Green" Block (now Hilton Pharmacy Building) ceased operation in March 1950 when all telephone lines were finally converted to the new dial system. According to Mr. Davison, this community was reported to be the only one of its size to have the dial system fully in effect at that time. The first telephone directory of the Hilton Telephone Company contained a listing of 30 names. Daily service was supplied from 7 a.m. to 9 p.m. except on Sundays. By 1945 when the company was purchased by Mr. Davison, 696 names were listed in the directory. Mrs. Emma Wadsworth was the last of the Hilton Telephone Co. operators to operate the old switchboard. Mrs. Bert (Nellie) Haskins is credited with having the longest continuous day service (24 years) and Mrs. D. A. (Elva) Paulson the longest service as night operator (23 years); Frank Cox served as one of the first night operators and was the last night operator for the company. Day Operators were Maude Ainsworth, Ella May Perry Ainsworth, Annabelle Wood Baughman, Harriet Smith Botcher, Edyth Peffer Bourque, Lillian Perry Bradley, Iva McKinney Clark, Ella Newkirk Collamer, Alyce Haynes Curtis, Mildred Cooper Klock Ephraimson, Flora Perry Goodwin, Mabel Black Goodwin, Geraldine Gates Harradine, Nellie Haskins, and Hazel Turgon Hawkins. Night Operators were Rena Haynes, Ethel Herrick, Cora Wade Hiler, Ruby Kerrison Howie, Ruby Pickett Hutchins, Cheryl Kerrison, Elna Madden Kerwin, Mona Perry Leary, Edythe Crook Orth, Ina Cox Pickett, Pearl Randall, Lurilla Stothard Stevens, Eleanor Tesch Stothard, Emma Newkirk Wadsworth, and Alice Wood. Substitute Operators were J. Harlan Cooper, John Magee, Joseph Batty, Frank Cox, Elva Baxter Paulson, Jeanette Bronson, Jewel Turgon Buell, Vivian Davis O'Dell, and Leona Bumtt Palmer..